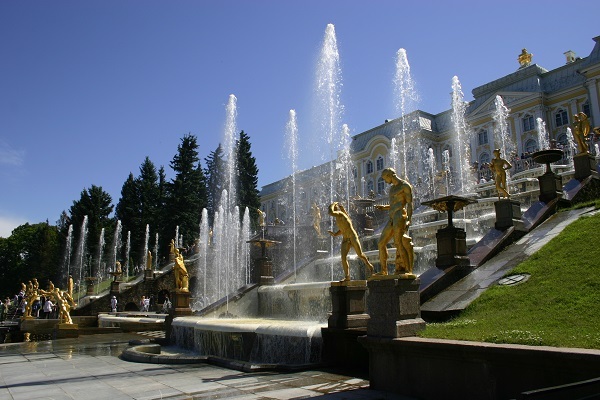 The Great Cascade is the main fountain construction of Peterhof and it has no equal in volume of water and size, luxury and expressiveness. The Grand Cascade is one of the largest fountains in the world - it consists of three waterfall ladders and two grottoes, 75 fountains and 255 bronze sculptures, mascarons and bas-reliefs, as well as other decorative details. The Big Cascade complex can be conditionally divided into an exterior, luxurious and magnificent, which is 42 meters in length and also the underground part located under the fountains - the Upper and Lowergrottos, which can be visited with an excursion. In the central part of the Grand Cascade, where the Lower (Large) grotto is located, there is a fountain "Trash", 28 inclined jets of which intertwine like the rods of a flower basket. On the right and on the left there are two cascading staircases in seven steps, which are decorated with gilt bas-reliefs, as well as sculptures alternating with vases. Above the Lower Grotto is the Upper (Small) grotto with a terrace enclosed by a marble balustrade decorated with vases.In the rift of the fence there are sculptures of triton trumpets. A little later on the terrace appeared two mascarons - Bacchus and Neptune, and between them in niches - marble busts - allegorical images of four seasons. At the foot of the Grand Cascade is set the most famous sculpture - a three-meter figure of Samson, tearing the jaws of a lion. With the sea the Great Cascade is connected by the Sea Canal, which has a width of 12 meters.Along it on the lawns are installed 22 fountains, the water in which rises to four meters and reminds crystal trees.During the government of Peter the Great along the Sea Canal, light vessels passed into the harbor to The Great Palace. The idea of ​​decorating of the royal residence from the seaside by a grandiose waterfall structure belongs to Peter the Great.The king wanted to show the maritime power of Russia and by the language of allegory to glorify its victory in the struggle for access to the Baltic Sea. 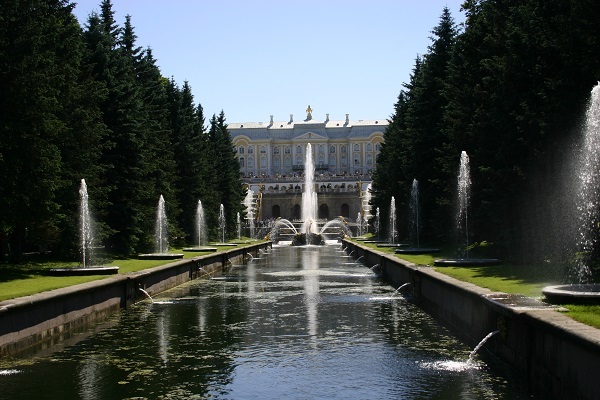 The building of the Great Cascade was started in May 1716, architects Jean Baptiste Leblon and Nicola Michetti, Mikhail Zemtsov and master hydraulic engineers Peter Sualema and Vasily Tuvolkov took part in the process of building. The grand opening took place in July 1723, but after the launch of the fountain, building works continued.Soon here have appeared sculptures of Perseus and Actaeon, Galatea and Mercury, as well as two new mascarons.Much later the Samson and Two Tritons fountains were installed, which trumpeted in shells, created by the architect Carlo Rastrelli. For many years the fountains have been rebuilt many times: the pedestals changed from wooden to stone and sculptures were re-sculpted. Restoration, which has begun in the middle of the XIX century, was not completed and in the result the original view of the fountain complex had been lost. During the war, many sculptures and decorative elements that haven’t been exported in time not have time, disappeared without a trace. Thanks to the efforts of the restorers and the help of the residents of Leningrad, after the war the Great Cascade was restored and in August 1946 its solemn launch took place and the complete restoration of the structure was completed in 1950. Restoration was also carried out in the 90's, then many underground communications were replaced and the lost elements of the fountains were restored. 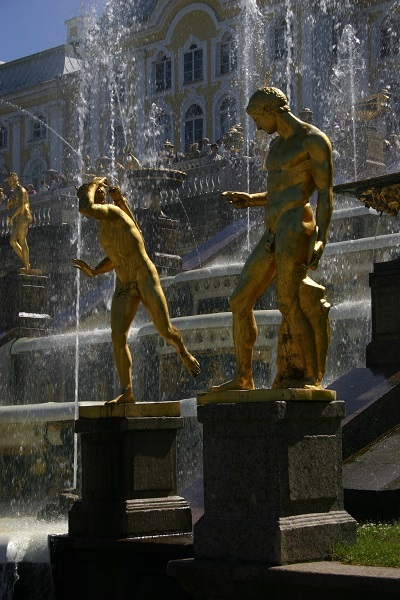 In 2010-2011, 37 sculptures of the fountain, which were in the emergency condition, were repaired, including the most famous of them - Samson, tearing the jaws of a lion.Thanks to the work of restorers, the Grand Cascade sparkles with gold and surprises with its splendor the guests and residents of St. Petersburg. The Samson Fountain is located in the Lower Park of Peterhof, in the center of the pool in the Big Cascade, and its full name is "Samson Fountain, tearing the jaws of a lion".This is the largest fountain of the Grand Cascade, the height of its flow reaches 21 meters. Peter the First planned to install a fountain at the foot of the Grand Cascade with a statue of Hercules defeating the Lernaean hydra.However, his plans were not destined to come true.Only in 1835, during the times of Empress Anna Ioannovna, in honor of the 25th anniversary of the victory over the Swedes in the Battle of Poltava, a fountain "Samson tearing the jaws of a lion" was installed. It should be remind that the victory over the Swedes was received on June 27, 1709, on St. Sampson's Day, and the figure of the lion symbolized the enemy, as the lion is depicted on the flag of Sweden. Thus, Samson symbolizes the greatness of the Russian state and the defeated lion is the symbol of defeated Sweden. Near Samson's feet there are 8 dolphins-fountains installed and from the mouth of the defeated lion a jet of water almost 21 meters high bursts.Lions, installed at the base of the pedestal, denote the four directions of the world. The author of the first composition, created in 1835, was Bartolomeo Carlo Rastrelli, and the pedestal was built according to the idea of ​​Russian architect Mikhail Zemtsov.Samson was portrayed with a beard and with a waving cloak and the sculpture was made of tin. Over time, because of the softness of the metal, the statue was heavily deformed and in 1802 it was replaced with a bronze one.The author of the new sculpture was Mikhail Kozlovsky.Now Samson was without a cloak, completely naked and looked like more as the mythical hero of Hercules than a biblical saint. At the same time, architect Andrei Voronikhin created a new pedestal with niches in which four gold-plated lion heads were installed. During the occupation of Peterhof by German troops, the sculptural group was abducted and possibly re-melted.In the postwar period, the statue of Samson was recreated from the surviving photographs and archival materials.The opening of the restored fountain took place on September 14, 1947, and a few years later, bronze dolphins were also installed. 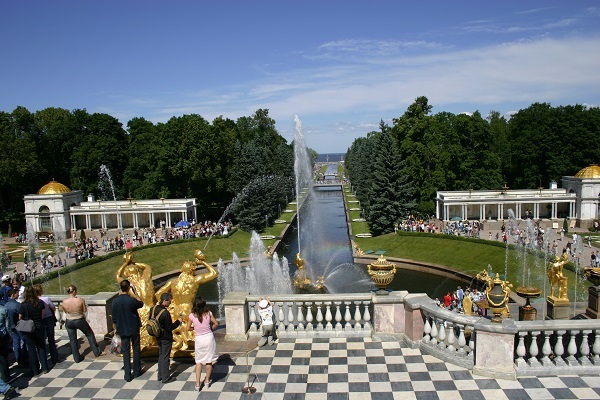 Water into the fountain system of Peterhof, including Samson, is fed by gravity from the Ropsha heights.On locks and canals, it gathers in reservoir ponds on the upper terrace and then along the underground pipes rushes to the fountains and cascades of the Lower Park. 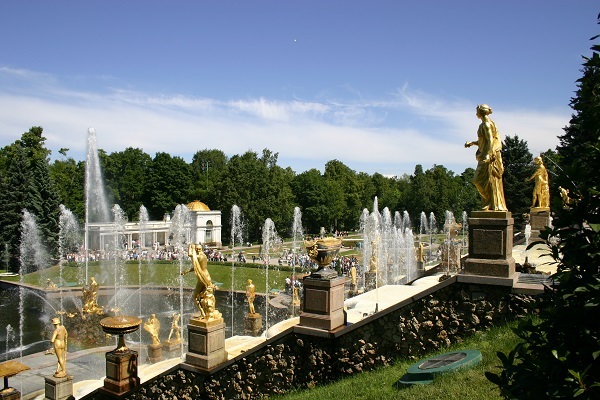 The Peterhof fountain system is original: unlike theVersailles, where special water-lifting devices are used, here water rises to a height of 21 meters without any pumps.